I tore my ACL in late June and recently came across this website and thought that it might help me out to share my story. so I left the tournament the next day on the first flight back home. 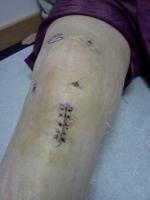 I saw a doctor the next day who confirmed that it was in fact not an LCL, but an ACL tear. After explaining how I would be missing the next school season and likely club as well, I returned home in tears. I knew that the process was going to be long and difficult, but I didnt know what I was going to do. The following couple of weeks before surgery werent too horrible as I could still walk and friends were there to keep my mind off of the whole scenario. The surgery was not as successful as had been anticipated. Softer bones called for a weaker graft and now, a longer recovery. But now, I am exactly one week out of surgery. Pain is not very bad, but my mental health is doing very poorly. I don't know what to do without volleyball. I am being distanced from friends who all play. Ive missed out on the annual varsity lake trip for team bonding. And I feel like such a wreck. I cant imagine not playing for an entire 6 months or more. I feel so sad all the time now and I need advice on how to cope with everything. I am still part of the varsity team technically. Ill be doing stats for this season, but I just don't have any idea how anyone can go so long without being able to do something that means so much to them. I cry all the time and writing everything down seems to help but I literally feel like everything I have worked so hard for is gone.I fear my chances as a captain on Varsity senior year are gone as well as my position as a libero because I'm missing out on all of this time as everyone else excels, I'm left behind. I already feel like my life as a volleyball player is over. I just need to know how to get through this. I have been told to try an avoid volleyball and focus on other things, but I can't do that when this is my true passion. These success stories have left me knowing that I'll eventually heal, but getting back into the game is going to be harder than I feel I can ever imagine. For those of you who have healed, how did you get through it? What did you do with yourself?